Where do young manta rays spend their time? Finally, researchers have an answer: Flower Garden Banks National Marine Sanctuary. 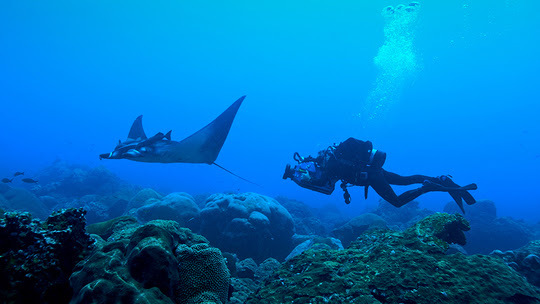 In a paper published in Marine Biology, Dr. Nancy Foster Scholar Joshua Stewart and sanctuary researchers Marissa Nuttall, Emma Hickerson, and Dr. Michelle Johnston suggest that Flower Garden Banks National Marine Sanctuary and the area surrounding it may represent the first documented nursery habitat for oceanic manta rays (Manta birostris) and a potential new species of manta (Manta cf. birostris). In light of the fact that oceanic manta rays were recently listed as threatened under the Endanger Species Act, this is quite significant. The protections provided within the sanctuary keep juvenile mantas relatively safe from threats affecting them in other parts of the world. We always knew this place was special. This new finding just makes it more so! Thousands of dead shad begin to accumulate at the rocks near the base of the Todville Road bridge in Seabrook, TX on the afternoon of June 6, 2018. Photo by Brandon Rowan. June 6, 2018 – A new fish kill has been reported in Galveston Bay near Seabrook. Thousands of dead shad are washing ashore near Todville Road and the surrounding area. 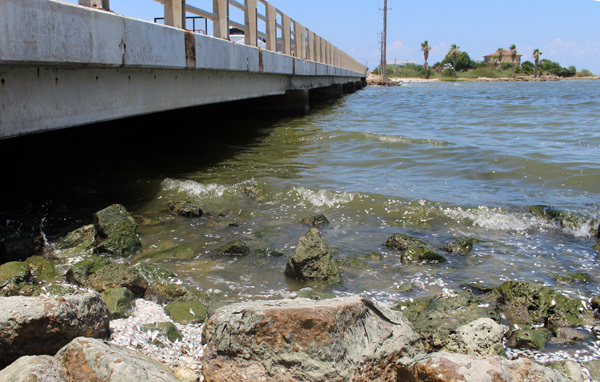 This is the second Galveston Bay fish kill reported in two weeks. 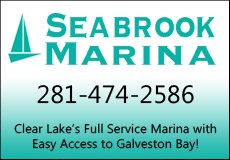 The Seabrook event comes only a week after a massive fish kill further north in the Bay near the Houston Yacht Club. Hotter-than-average temperatures in late May and early June are most likely responsible. Hot weather depletes oxygen supplies from the water and suffocates these small fish. Due to health concerns, Texas Parks and Wildlife discourages fishing in areas where fish carcasses have accumulated. You may report other fish kills to Texas Parks and Wildlife by calling their 24-hour hotline at (281) 842-8100. The fiscal year 2018 National Defense Authorization Act (NDAA) was recently signed into law, which includes provisions from the Domestic Maritime Centers of Excellence Act (H.R. 2286). 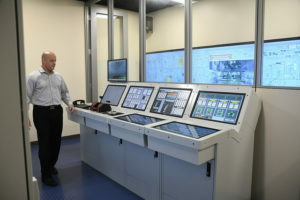 This authorizes federal designation of community and technical college “centers of excellence.” Pictured is John Stauffer, associate vice chancellor and superintendent of maritime at San Jacinto College, in the engine room simulator at the College’s Maritime Technology and Training Center in La Porte, Texas. Photo credit: Jeannie Peng Mansyur, San Jacinto College marketing, public relations, and government affairs department. President Donald Trump signed into the law the fiscal year 2018 National Defense Authorization Act (NDAA), which includes provisions from the Domestic Maritime Centers of Excellence Act (H.R. 2286) that authorizes federal designation of community and technical college “centers of excellence” to help provide technical education and training programs to secure the talent pipeline for the nation’s maritime workforce. 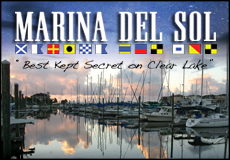 Congressman Gene Green (D-TX-29) introduced the Domestic Maritime Centers of Excellence Act. In September, the legislation was offered on the Senate floor as part of broader package of maritime provisions contained in an NDAA amendment by Sen. John Cornyn (R-TX). As a Maritime Center of Excellence, San Jacinto College will expand its capacity to train domestic maritime workers by admitting more students, training faculty, expanding facilities, creating new maritime career pathways from associate degree to baccalaureate degree programs, and awarding credit for prior learning experience – including military service. A lack of federal government focus on domestic maritime industry technical training, maritime workers approaching retirement, technological advancements, and the expansion of the Panama Canal are all factors that affect the maritime workforce shortage. Under the provisions of the Domestic Maritime Centers of Excellence Act, the U.S. Maritime Administration (MARAD) can support community and technical college centers of excellence by providing funding and support, technical assistance, and donating surplus federal assets for maritime education – such as marine vessels for use in training programs. Recently, San Jacinto College received support from MARAD to allow maritime students access to Ready Reserve Fleet ships to keep current with the most recent developments of the Standards of Training, Certification and Watchkeeping (STCW). San Jacinto College has awarded more than 5,500 U.S. Coast Guard (USCG)-approved course completion certificates since 2010 and introduced the state’s first associate degree program in maritime transportation to train those new to the maritime industry. Last year marked the opening of the College’s Maritime Technology and Training Center on the Maritime Campus in La Porte, Texas, to offer more training opportunities for new and incumbent mariners. The San Jacinto College Maritime Technology and Training Center on the Maritime Campus offers a full calendar of USCG-approved maritime courses. For more information and to register, visit sanjac.edu/maritime. 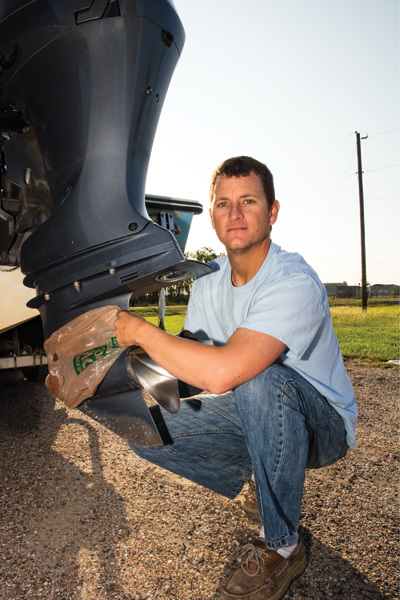 Captain Shane Cantrell shows how a 2 cent plastic bag nearly cost him $80,000. Photo by Jim Olive. Plastic in Paradise is a three-part series on the prevalence of plastic in the Gulf Coast’s marine life, and how it affects the food we eat and the water we drink. Speaking to local groups who deal with it everyday, they tell us how prevalent plastic pollution is along the Gulf Coast, and what we can do to reduce it and to eliminate it from our lives. 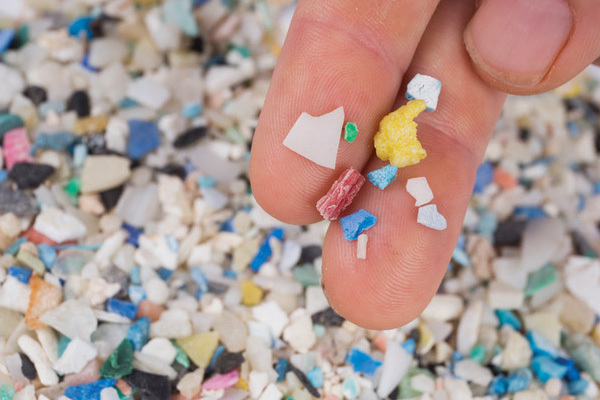 As much as 90% of floating marine debris may be plastic. And that doesn’t account for all the plastic that sinks to the bottom of the ocean, settling in sediment for thousands of years. Researchers estimate that 70% of plastic pollution will never be seen because it sinks out of sight. 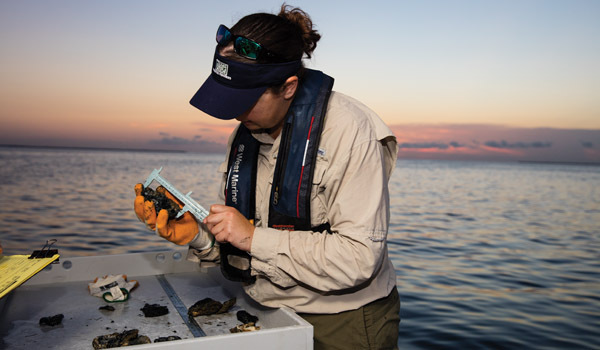 While a definitive study on the impact of plastic on the Gulf of Mexico has not be conducted, institutions along the Gulf Coast from Florida to Texas are now banding together to collect, quantify and analyze plastic samples found along our shores. It’s the sound that no captain wants to hear: an alarm onboard goes off while you’re ten miles offshore. 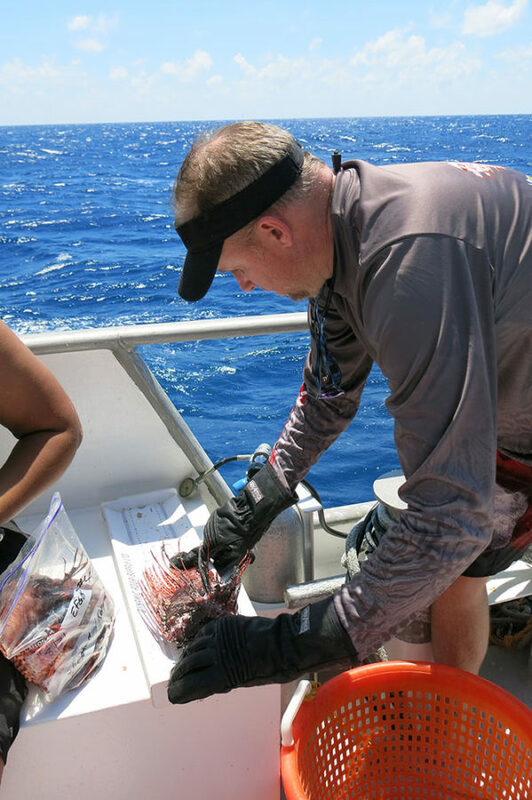 That’s what happened last August to Captain Shane Cantrell aboard his charter vessel, Sharecropper. The boat was full of paying clients, ready for a day of fishing. They had cleared the Galveston jetty and were well out of site of land. Something triggered the overhead alarm on the intake. Cantrell stopped everything to open up the engine hatch and take a look. Inside he saw convenience wrapped around his gear case: a plastic ice bag either thrown overboard or allowed to get loose by someone. Ten miles offshore, a single bag had sucked up in his engine and blocked off the intake for the water pump that keeps the engine cool. Sharecropper’s twin engines were overheating and could have failed, leaving Cantrell stranded in the Gulf of Mexico with a boatload of clients. A single 2 cent bag could have cost Cantrell $80,000. If he had lost both engines, Cantrell figures their replacement would have cost up to $30,000, and his downtime in high season could have meant $50,000 in lost revenue. Joanie Steinhaus of Turtle Island Restoration Network says juvenile turtles bit these plastic bleach and vinegar bottles that washed ashore Bolivar Peninsula. Photo by Jim Olive. Long-time San Leon resident Stennie Meadors shares that same observation. She speaks with over 30 years in the field of environmental management. For ten years till 2001 she was an emergency response manager for Texas Commission on Environmental Quality handling response units for spills. She worked on the Exxon Valdez oil spill, and before that, she conducted hazardous waste inspections in the Houston area. A turning point for her came in 2007 when her grandson brought her the skeleton of a brown pelican with a plastic bottle lodged in its pelvic area. The bottle may have come from across the ocean, or it may have been deposited locally. Meadors tells of the plastic bottles that washed up recently at Bolivar: about 50 bottles were found – small, yellow and worn-out, the product of Industrias Macier SA. The bottles were also punctured with holes. Meadors discovered they were bite holes of juvenile turtles. The bottles had floated across the Gulf from the Dominican Republic and drifted onto the beaches of Texas and Louisiana. Filled with vinegar or bleach, the contents had been used to distill water in the Dominican Republic. “They sell for 10 cents a bottle, get discarded and then get caught up in the Gulf Stream and land on our shores,” Meador says. She has given some of the turtle-bitten bottles to Joanie Steinhaus to display. 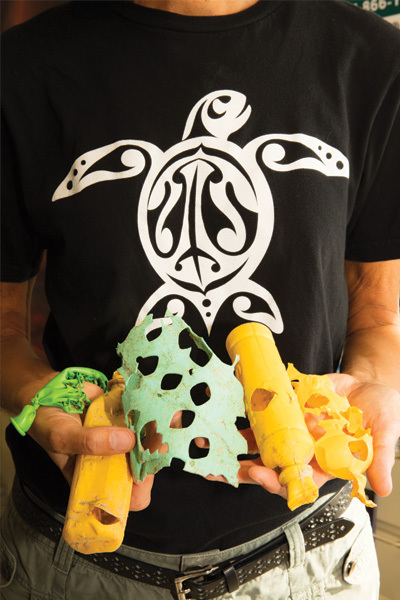 Steinhaus runs the Galveston office of the Turtle Island Restoration Network, and uses samples like these to bring awareness to the public and to students they work with in Galveston’s schools. That attitude prevails in North America and Western Europe which use 80% of the 4 trillion plastic bags produced each year. For Steinhaus, “It’s one simple change, and people fight it.” People like Gov. Greg Abbott. He opposes individual cities banning the plastic bag, claiming that Texas is being “California-ized.” Also opposing city ordinances to ban the bag is Texas Attorney General Ken Paxton. He’s asked the Texas Supreme Court to affirm the Fourth Court of Appeals decision that declared Laredo’s plastic bag ban unlawful. Paxton is calling a bag ban by individual cities unlawful because it violates state law, the Texas Health and Safety Code, which forbids municipalities from making rules to “prohibit or restrict, for solid waste management purposes, the sale or use of a container or package in a manner not authorized by state law. Last year, resistance came on another level, Steinhaus says, when after working with a team of Galveston city officials to draft an ordinance on the marine environment, City Attorney Don Glywasky received a call from a South Carolina law firm with the intent to sue if Galveston passed its bag ban. The Texas Supreme Court is scheduled to hear Laredo’s case on Jan. 11. The court’s ruling will have implications for Houston, Galveston and all other Texas cities that want to determine their own bag law. In the meantime, businesses and individuals are choosing alternatives to the plastic bag. 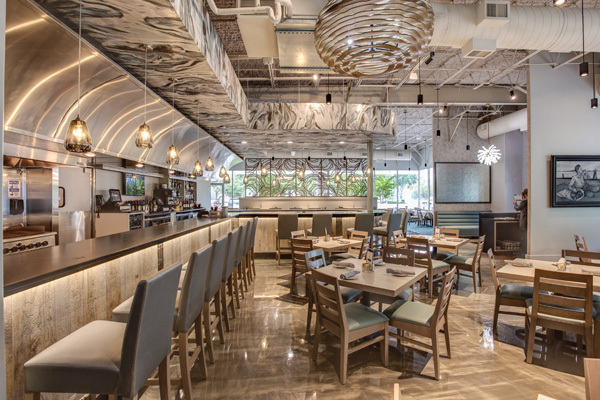 “For hotels, it was easy for them to eliminate them,” says Steinhaus, “They have very limited use; their gift shops – especially the places like the Tremont, The Galvez or the Hilton, their clientele doesn’t mind. Most of them use paper bags or sell bags.” For the island’s smaller shops where price margins matter more, Steinhaus is in favor of forming a bag coop to lower the cost of paper bags for individual shop owners. Refuse the bag; bring your own bag and bottle. Bundle your plastic bags and deposit them at recycling receptacles located at the front of most grocery stores. Buy your own re-useable bags and keep them in your car. If you don’t yet have a collection of re-useable bags, use paper bags. Tell the store manager you’ll shop elsewhere unless they provide an alternative bag, like a paper bag or one you can buy and re-use. Recycle any plastic bottles you find or purchase. Instead of buying bottled water for home consumption, buy a Brita or other water filter, and filter your own water. Drink for drink, it’s less expensive, too. Tell your city, county and state representatives what you want done about the plastic bag and bottle. Join a local advocacy group. Help with clean ups. Spread awareness and good habits. You can do it every day or once a year. Lisa and Raz Halili of Prestige Oysters. 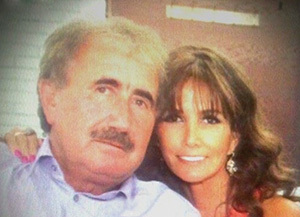 It is a love story, and a story of the American dream. 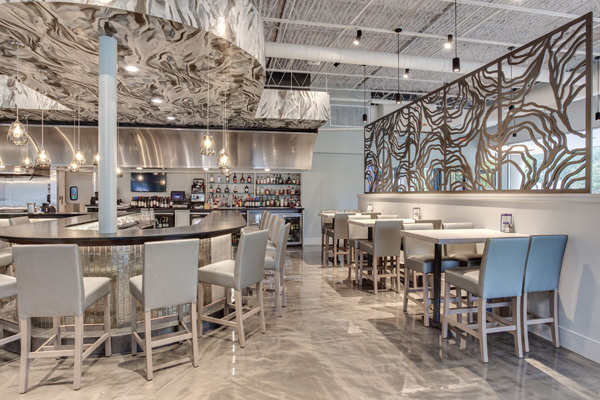 Johnny Halili, a little boy in Albania, never dreamed he would be an oyster mogul in the U.S. In the 1970s, coming from his home country to Chicago, he began his American work life in a car wash. Drifting from job to job, he heard from his cousin that there was work in Louisiana; so off he went. Working on a boat for the first time, he was a deckhand and worked very hard for years. Eventually he bought his own oyster boat, the Lady Katherine, and that is when his successful American dream life began. Prestige Oysters is a private family run business which continues with his best deckhand Lisa, who later became the love of his life and his wife. Working through all kinds of weather, they never gave up their dreams. The couple are now joined by their son Raz in this family owned and run business. 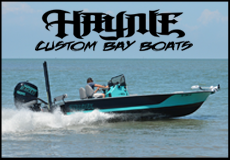 The company has two full-time processing plants providing market for over 100 boats from Texas to Louisiana and Maryland. 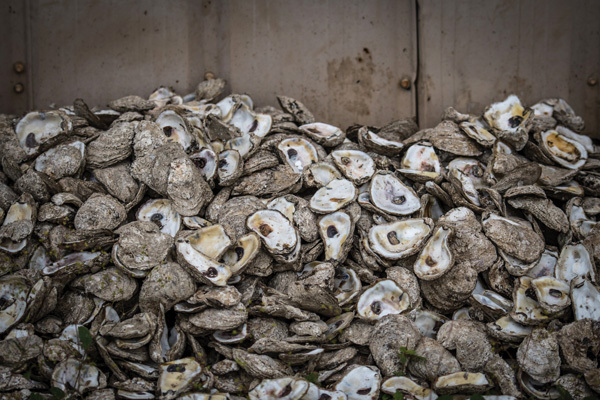 The family was able to increase their business with the acquisition of the Quintus 350L high-pressure processing machine and CryoQuick tunnel to process oysters. 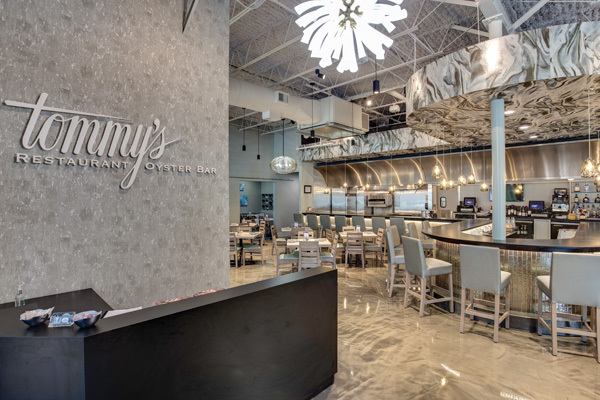 In 2013, the company acquired Joey’s Oyster Company’s state of the art facility with HPP technology in Amite, Louisiana. The High-Pressure process is a food processing method using water and elevated pressures to achieve consumer desired goals. In 1990s, HPP emerged as a method of processing food, but not until the 21st century was it applied to seafood. The advancements in HPP technology over recent decades have proved this method of food processing is of the highest quality. From fresh juice to meats and seafood, HPP neutralizes listeria, salmonella, E. coli and other deadly bacteria. 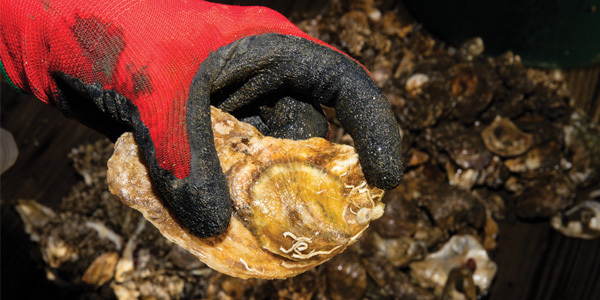 Their Treasure Band oysters have undergone our High Pressure Process which reduces the Vibrio Vulnificus and Vibrio Paraheamolyticus to non-detectable levels. The idea for the purchase of the multi million dollar machine was that of the father, according to Raz. According to his mother Lisa, Raz took the business to a new level, when he approached the giant Sysco Foods. “He was just this kid with an idea, and he made it happen,” said the proud mom. “We would have never even thought of it, but after college he came on the sales side of the business and this was his venture, and he took a chance and did it for us. It made all the difference. We are very proud of him. We were just simple wholesalers, and he took us to a whole new level. Like his father before him, the son now 31, had a vision of where he wanted to take the company. After pitching the idea to the seafood director at the time, he felt confident this was a program with a story behind it that could sell. Although the idea and the execution was the son’s idea, he says he learned so much from his father, from whom he got his work ethic. We all want clean neighborhoods, but does anyone know the specific agency that cleans up pollution in our cities and communities? The problem is that it’s not just one agency responsible for responding to all kinds of water and land pollution – it’s a myriad of county, state, and local government entities in any given region that each respond to different kinds of pollution. The agency in your neighborhood that cleans up sewer overflows may not be the same that cleans up chemical spills or illegal dumping. And if you cross into another city, it may be a completely different set of agencies responsible than those in your hometown. This complicated framework for reporting pollution can be discouraging for individuals who see pollution and want to do something about it. 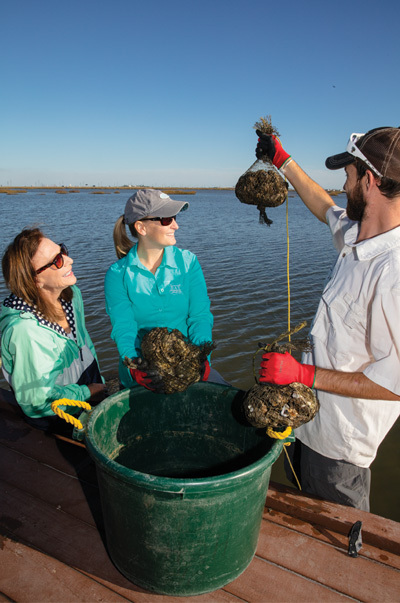 That’s why Galveston Bay Foundation developed the Galveston Bay Action Network, an online tool and free mobile app that allows users to report any land or water pollution in Harris, Galveston, Chambers, and Brazoria counties quickly and easily. 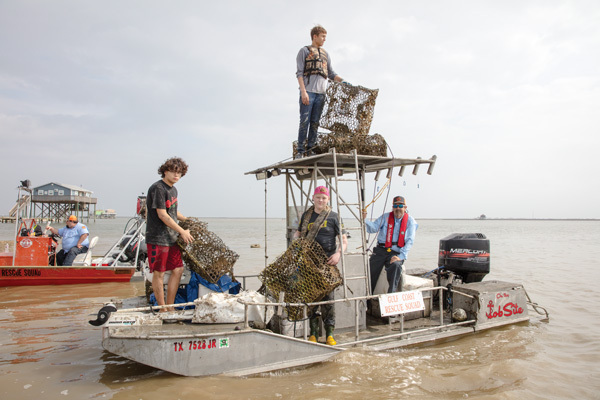 The Galveston Bay Action Network allows users to report various kinds of pollution such as trash/debris, oil spills, fish kills, wetland destruction and more by simply submitting a single online form that can be supplemented with photos or videos of the pollution event. These reports are then automatically sent to the specific agency that can respond to them based on the location of the report and the kind of pollution observed, taking out the work of tracking down the correct agency for you. Help keep our communities clean and download the app on Google Play and iTunes, or report pollution on a desktop at www.galvbay.org/gban. The winning bucket by Olivia Hopkins. Galveston Artist Boat’s Beautify the Bucket Competition is designed to allow citizens to take an active role in beautifying Galveston’s beaches in a way that also encourages better stewardship behaviors in others. Marine debris is a serious threat to organisms in our coastal and marine ecosystems. While the three “R’s” (Reduce, Reuse, Recycle) will help prevent marine debris all throughout the watershed, proper use of trash receptacles can reduce debris directly from the beach. On Earth Day, April 22, 49 trash cans painted by local artists of all ages were on display at the Texas Adopt-a-Beach Beach Clean Up meeting location at Menard Park on the Galveston Seawall. Later that evening, the trash cans were moved to the Galveston Arts Center during Artwalk, where the public voted on which trash can they liked best for the People’s Choice Award. 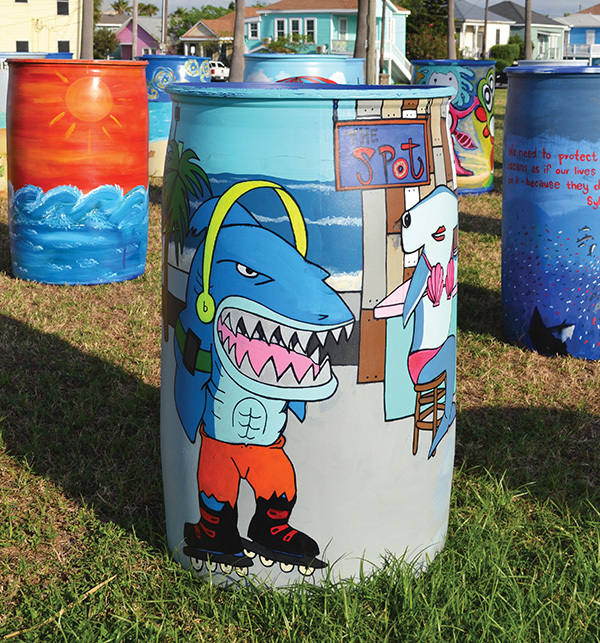 All 49 trash cans will be placed on the beach along the seawall for the public to utilize and enjoy. The next Beautify the Bucket competition will be held Sept. 23, 2017. Visit www.artistboat.org for more information. Our area has been blessed with Galveston Bay, one the most productive estuaries in the country and the most productive in Texas. 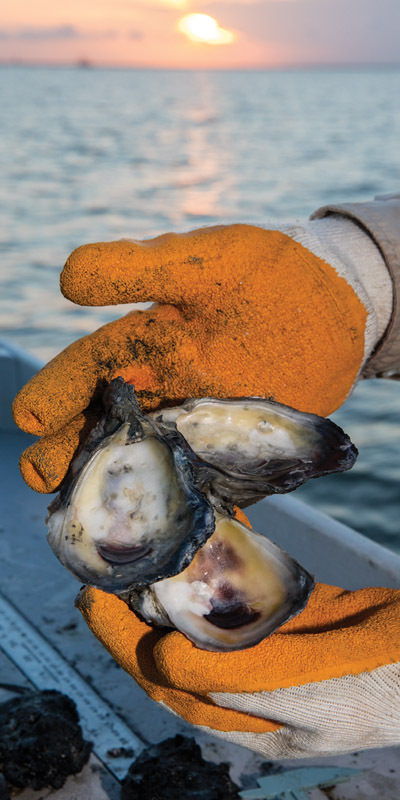 From its waters, a full third of the state’s commercial seafood harvests and recreational fish are landed, creating an economic engine of related businesses and quality of life for area citizens. The Bay is renowned for its oysters, shrimp, crab, redfish, flounder and speckled trout. The Bay ecosystem also supports a thriving ecotourism industry and people travel from all over the world to witness the resident and migratory birds that grace our shores. The Bay area is also the home of hundreds of thousands of people, one of the busiest ports in the nation, one of the biggest petrochemical complexes on the world, wonderful medical centers and, of course, NASA. 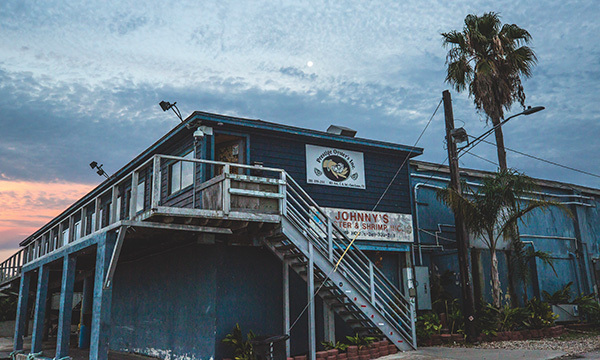 After the damage and loss of life wrought by Hurricane Ike in 2008, it only makes sense that residents, academic institutions, and government is looking for ways to lower the risk from future hurricane storm surges. 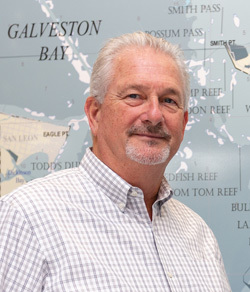 The Galveston Bay Foundation supports such efforts, as long as all of the potential benefits and costs are fully known and all environmental impacts are openly discussed and addressed through a robust scientific investigation and review process, and the impacts are ultimately avoided or minimized. GBF’s mission is to preserve and enhance Galveston Bay as a healthy and productive place for generations to come. Just looking at things from a purely environmental damage standpoint, we recognize that if a major storm surge were to strike our industrial complexes there could be a disastrous release of petroleum and other petrochemicals that could lead to an ecological disaster. So, we agree that there needs to be system(s) in place to prevent that occurrence, whether it’s proper management practices and protective levees at individual plants to levees that protect a whole industrial complex, e.g. the Texas City Levee System or Freeport Levee System, to a larger regional protection system such as the Texas A&M at Galveston’s Ike Dike concept. In short, there are ways to prevent those releases on multiple scales. However, we are also a part of the local community, living and making our living on or near the Bay, and want to be a positive voice in the discussion on how best to protect not only the environment, but also people and infrastructure. As with mitigating damages to the environment from storm surge, there are also multiple ways to protect people, homes, and businesses, both structurally and non-structurally at a range of scales. The biggest question is just what is it we need to protect from storm surges. It is a fair question to ask if we need to install a coastal spine like Ike Dike the whole length of the Upper Coast to try to protect every shoreline structure from High Island to Freeport when many are already elevated and many others could be brought up to standard. Maybe a coastal spine will end up being the best answer, but all of the alternatives need to be discussed and debated in an open, transparent manner. Getting back to environmental impacts from structural solutions, we must be aware of unintended yet irreversible damages that can be done to Galveston Bay and all it provides unless we proceed carefully, be it the Ike Dike concept, SSPEED Center’s Houston-Galveston Area Protection System concept, or the Gulf Coast Community Protection and Recovery District’s Phase 3 Recommended Actions. GBF is concerned about both direct and indirect impacts to the Bay and its habitats, but what concerns us most is the proposed massive gate structures at Bolivar Roads and, in the case of the Ike Dike, also San Luis Pass. We should note that SSPEED has also included a middle Bay gate as an option to the Bolivar Roads gate. That gate, too, also raises concerns. 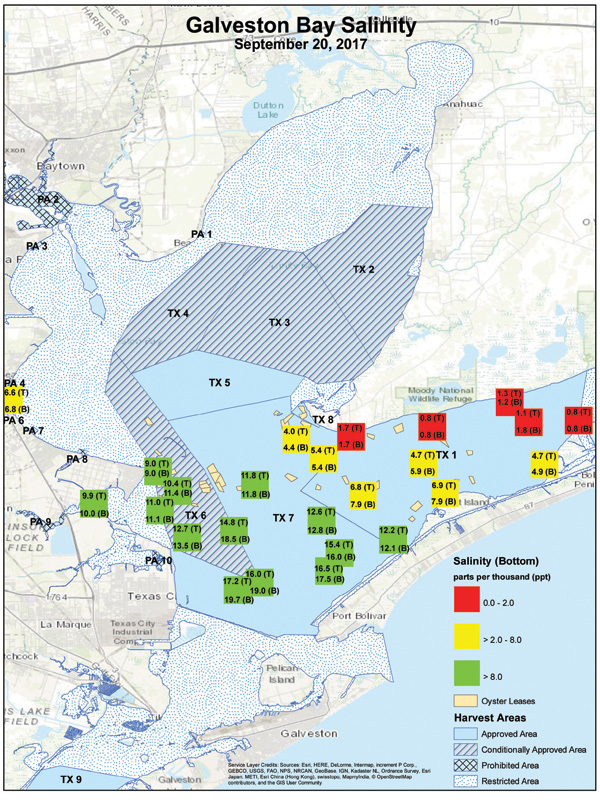 Besides the release of oil and petrochemicals, the only other possible major ecological damage to the Bay related to hurricane surge will be indirect effects from the installation of these gates to water circulation, salinity, sediment transport and the movement of larval and post-larval shrimp, crabs and fish. Environmental lift gates and navigational gates at Bolivar would be open 99.9% of the time, but based on the information we have seen, the passes’ natural width would be permanently reduced by 40-50% to accommodate the footings and other structures that house the gates themselves. Thus, they would always restrict the flow and greatly increase velocities. At this time, we do not know what effect these gate structures will have on the movement of our critically important recreational and commercial species. If we are not careful, we could lose those fisheries and the businesses that depend upon them, and that would be an unacceptable huge blow from an ecological, economic and quality of life standpoint. To prevent such negative impacts, GBF is asking is that all possible structural and non-structural options are truly debated and that rigorous environmental research and studies be completed upfront on the structural options that can permanently alter the Bay’s natural processes. We need complete information to make a good decision, because once huge structures are built there is no going back. The Kraken prior to its sinking. Photo TPWD. 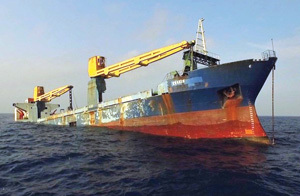 The Texas Parks and Wildlife Department’s Artificial Reef Program sank a 371-ft cargo vessel, named The Kraken, earlier this year in January. 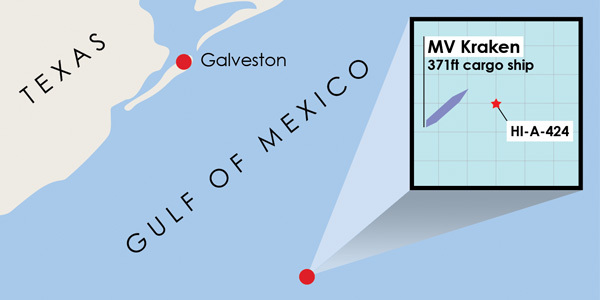 Dubbed the Kraken after the mythical, squid-like sea monster immortalized on film and in literature, the vessel was sunk 67 miles off the coast of Galveston to create a new artificial reef (located at GPS coordinates 28 26.634 N, 94 17.168 W). The Kraken began its journey in May 2016 when it was towed from Trinidad to Brownsville to be repurposed for its new life as an artificial reef 140 feet below the surface. Contractors with Cahaba Disaster Recovery LLC worked with the Artificial Reef Program to remove all fuel, oil and hazardous materials from the vessel in order to comply with the Environmental Protection Agency’s best management practices. Over time, this sunken ship will become an artificial reef that attracts fish, coral and other invertebrates, as well as divers and anglers. Given its location, this wreck could become a hot spot for grouper, amberjack and snapper. 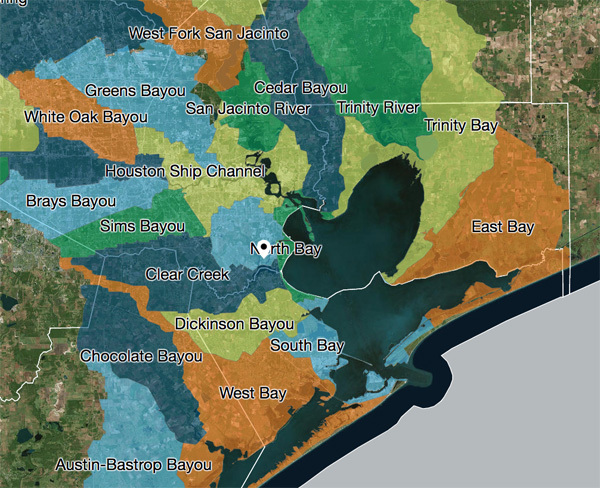 Under the ‘find your watershed’ tab, you can enter in your city or zip code to find information about the bay, river or bayou in your community. 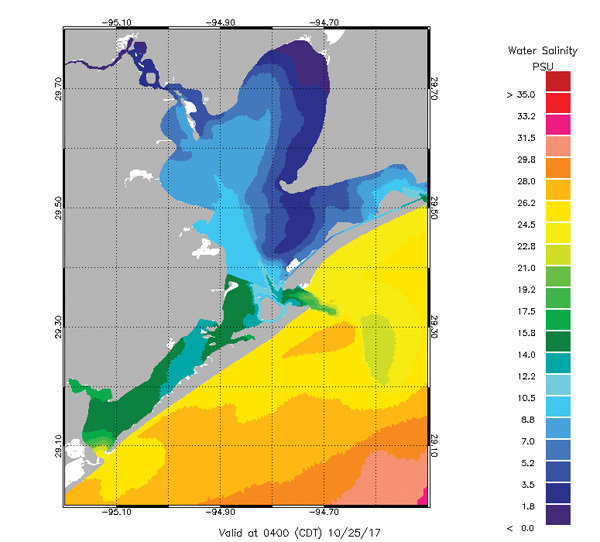 The Galveston Bay Foundation, partnered with the Houston Advanced Research Center, has released the 2016 report card for Galveston Bay. The grade is a C, the same as last year, after averaging the six categories of Water Quality, Pollution Events & Sources, Wildlife, Habitat, Human Health Risks and Coastal Change. Some categories improved from last year, but some got worse. 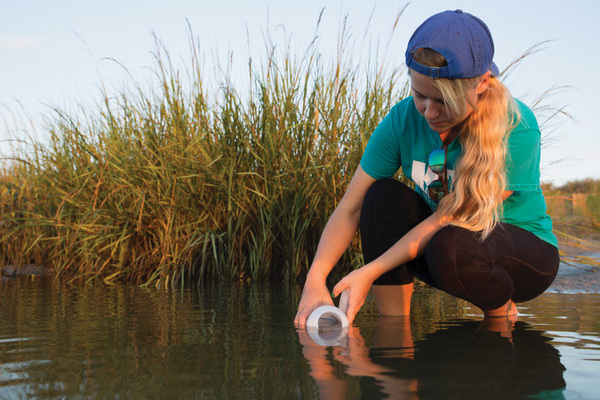 View the full report card here and see what you can do to help the health of Galveston Bay, the 7th largest estuary in the United States and the body of water where many Texas residents work, live and play. This 27-inch trout came from a mix of widgeon and shoal grass. Galveston Bay doesn’t have a large amount of sea grass. Prior to 2008 we had very little at all, with the exception of Christmas Bay and three areas where grass had been planted by the Galveston Bay Foundation during the late 1990s. Galveston’s West Bay did historically have sea grasses, like much of the Texas coastline, but they had long since been wiped out. During the 1990s, when I moved to the Galveston area and started fishing, Christmas Bay was the only area where I could consistently find sea grass beds to fish. Though, there were years when certain coves in West Galveston would grow sea grass, it was primarily widgeon grass. It might grow well one year and then not be seen in the area for several years. Back then, I didn’t really realize why this grass was here some years and not others. I did however always know the benefit of the sea grasses and the incredible habitat that it provides for sea life. These patches of planted grass were a fantastic improvement for the bay. Prior to these plantings, there was only sporadic grass growth along the north shore spoils, primarily widgeon grass. Due to these grass projects and an interesting set of recurring circumstances, the shorelines of West Bay have been transformed. 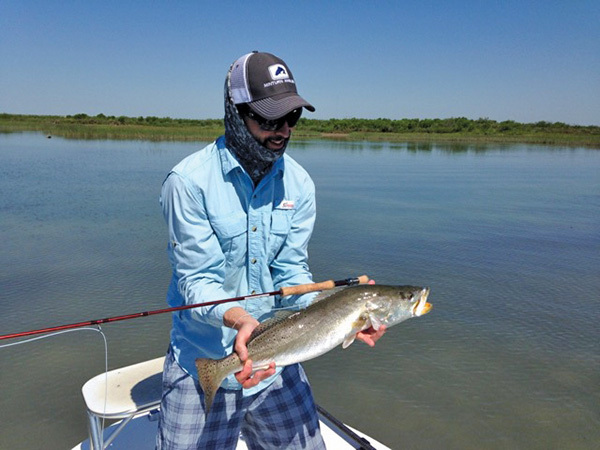 All of us who fish are well aware of how breezy Galveston can be during spring with wind directions predominantly from the south or southeast. There are many days when 15-25 mile per hour winds are the norm. Stepping back and taking a look at the big picture, and remembering the three areas where grass was planted and thriving, add some powerful south winds and a seeding period in late spring, and the result is spotty grass growth along north shore spoils. The first area that I remember seeing it was west of Karankawa cut. This long flat filled in with grass rather quickly while other areas took slightly longer to grow. Next was the stretch from Greens Cut to Karankawa Cut. Over the years since, this grass has spread and now covers nearly every inch of the West Bay spoils. We don’t experience the same level of grass growth every year, nor do we have the same grasses appearing. We have high and low salinity years, and as it turns out, some grasses are more adept at growing during each of these types of years. Spartina grass (Spartina alterniflora) along our shorelines grow in both high and low salinity and don’t seem to be effected much by annual changes. Widgeon grass (Ruppia maritima), grows prolifically in lower salinities and it is very different when compared to shoal grass. 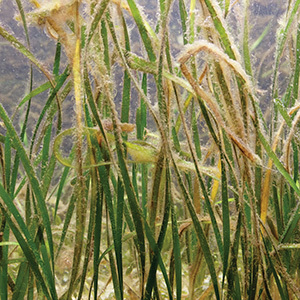 Widgeon grass has multiple offshoots along the length of the plant stem, grows rapidly during low salinity periods and grows much taller than shoal grass. This grass will continue to grow rapidly during spring and will often grow to the water’s surface. Interestingly, as we often experience high tides in spring in conjunction with higher south winds, widgeon grass will grow to the level of the water during these high tides. This sounds great, and as it benefits the environment, it is. Due to the multiple offshoots, greater height and the density of its growth, this grass makes for an exceptional cover structure for all of the small prey animals that inhabit these areas, and the predators that follow them. Not that it makes much difference, nor can we change what mother nature sends our way in terms of weather, but it will help you to understand when and where these grasses grow and how they will impact the water where they are present. 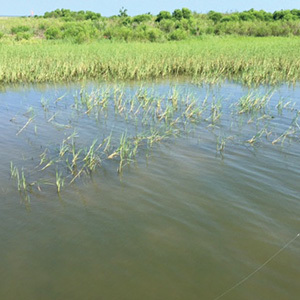 Shoal grass is an incredible water filter and provides very good cover and habitat for small fish, crabs and shrimp that redfish and trout frequently feed upon. Widgeon grass on the other hand, does not tend to filter the water column nearly to the degree that shoal grass will. Widgeon grass will definitely grow much thicker and provide a great habitat for both prey and predator, but will not give us the clarity of water that shoal grass provides. 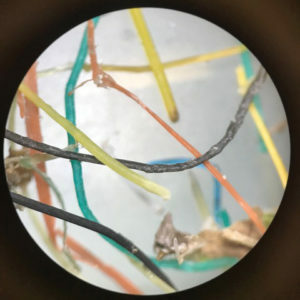 For those who have been fishing the grassy areas over the past few years, you are quite aware that 2015 and now 2016 have not been great water quality years. The underlying case has been low salinity. Though we do have some areas with shoal grass, for the most part the bay floor has been taken over by widgeon grass and will stay that way until late summer when salinities are higher. Unfortunately, this is in my experience typically too late for the shoal grass to recover and grow as the early season growth of the widgeon will choke out and prevent photosynthesis. One last note about sea grasses and Galveston Bay, and well the entire Texas Coast for that matter. 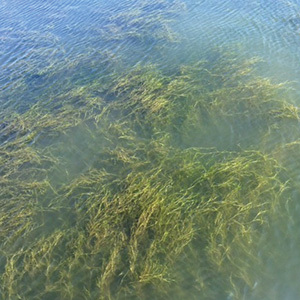 Don’t quote me on the exact timing, but two-to-three years ago, Texas Parks and Wildlife department passed a law prohibiting the intentional destruction of sea grasses. These grasses are a valuable and limited part of the overall habitat, providing cover structure for numerous animals both predatory and prey. 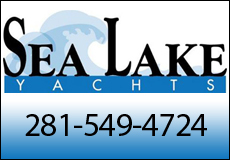 This resource can be damaged and frequently is by boaters either unaware or not concerned. Given the rate of growth and expansion of the areas with sea grasses over the past ten years, we can only hope to see a continuation of this trend. With some cautious stewardship from all who operate boats in these areas, this may be a trend that continues and provides excellent habitat and fishing for many years to come.